We returned home from Israel on Tuesday, and it has taken a few days to settle back in. A big time change is not easy for people without medical issues, although Mr. Twitchy and I have been fortunate to usually be able to adjust pretty quickly. The biggest issue for me and most of the Parkies I have spoken to about traveling, is the disruption of our medication schedules. With a 15 hour flight home, coupled with the 10 hour time change, I just kept taking my Carbidopa/Levadopa every 5-6 hours and hoped that would work. The timing of the other medications are not as crucial for calming down my symptoms. Before I left for Israel, I arranged to meet with several people about research and services provided for people with PD living there. 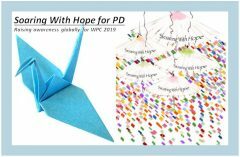 One of the people I contacted is Debbie Shapiro, who is also a blogger for the 2019 World Parkinson Congress. Debbie attended the WPC in Portland with Dr. Tanya Gurevitch from Sourasky Medical Center in Tel Aviv (more about her and others I met in Israel in a future post). Debbie, a mother of 9 originally from San Francisco who has PD, was so inspired by what she saw at the WPC that she came home determined to do something for people with Parkinson’s in Jerusalem. Posing as a hiker with my walking stick! Debbie’s experience was much like mine. We both became well informed about Parkinson’s after our diagnoses in order to cope with it. It did not take long for other people started reaching out to us because we were willing to speak to others about coping and living with the disease. In my case, I started this blog to reach out to others more easily and share our experiences in this exclusive club. For Debbie, it meant starting a program for people with Parkinson’s in Jerusalem where there was nothing offered. Tikvah4Parkinson, (Tikvah means Hope) provides exercise programs, boxing, support groups, etc. In other words, a community for PwP’s. Debbie has no background in physical therapy, speech therapy, tai chi, or any of the other things that are offered by Tikvah, but called in experts to help her put it all together. Her program has been so successful that she is is moving into a larger space and is looking for help to manage the program. She told me that many people in Israel believe that they will only live 5 years after their diagnosis and do little to improve their quality of life. She wants that to change. Debbie says: “We need to make people aware of the disease and help them realize that it’s a challenging, life-changing condition, but not a death sentence.” Because of her passion for this project, the people attending her programs are all showing improvement in their symptoms and their outlook on life. She is definitely making life better for many with Parkinson’s in Jerusalem. I’m so glad you’ve written about Debbie Shapiro. I met her while attending the World Parkinson Coalition in Portland, Oregon, and I was impressed with her determination and optimism in making the world a better place for people with Parkinson’s disease. You can do it, Debbie!